Aloha!! !I’m still in the process of the certification programme of ACR (Authentic Caribbean Rum). I have taken part in the training sessions, and I have my diploma, now I prepared a cocktail and answered some questions to try to access to the second phase of the certification: the ultimate training session delivered in the Caribbean (as they announced, in Guyana, Barbados and Trinidad). If you want to know more about this ACR certification programme first phase you could read this and this. 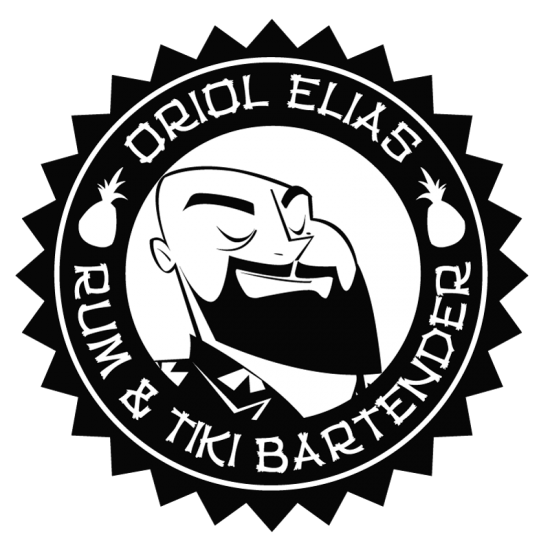 And now I’m going to present my cocktail…I have a lot of rums to choose and I want to make something tiki, but with a touch of classic and also a touch of craft cocktails. I thought in a 1934 Zombie, but also in an Old Fashioned and in something smoked…I started working on how to reduce a 1934 Zombie into an Old Fashioned format…and when I have it…I started to try to make a smoke of one of the ingredients: Falernum. All served in a skull glass bottle used as a decanter full of Falernum smoke to drink in a Double Old Fashioned Glass with a twist of Lime with an ice ball, also smoked. 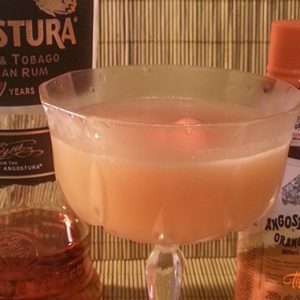 The only problem was that ACR didn’t have overproof rum in his range, but I loved to use 3 great rums from Guyana, Barbados and Trinidad: El Dorado 15, Doorly’s XO and Angostura 1824. Add all the ingredients (except the Falernum smoke) in a mixing glass filled with ice cubes and stir. 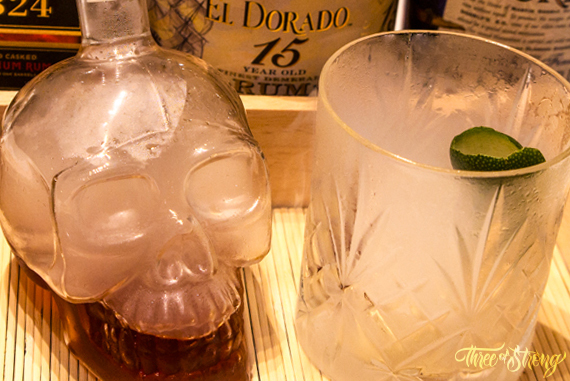 Strain the drink inside a skull glass bottle with the help of a funnel. Fill the skull glass bottle of Falernum smoke with the smoking gun full of oak chips, ground cloves, grated ginger and grated lime peel. Then close the bottle. Put a lime twist and an ice ball inside a chilled double old fashioned glass. 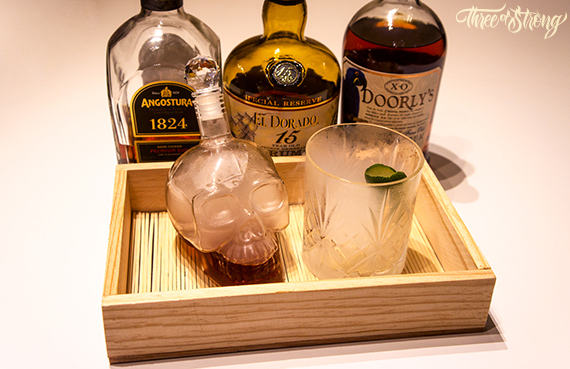 Serve the skull bottle and the glass in a tray and add some Falernum smoke in the chilled double old fashioned glass too. Each one has to serve the cocktail himself and enjoy it!!! *To make Falernum Smoke: Fill a smoking gun with oak chips, ground cloves, grated ginger and grated lime peel. If you liked my cocktail please vote it here . 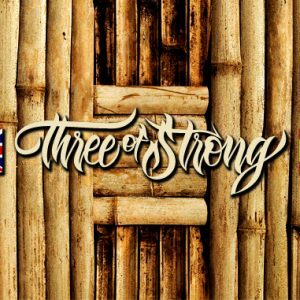 I need your help and you only have to click on the link and register in the web, it’s only 2 minutes and you could help me to improve my rum knowledge to make a better work in that blog…if I could go to the training sessions in the caribbean I promise that I will blog the full trip!!!! Very innovative drink! and beautiful! of course I voted, good luck!